It's time to add a new recipe to your appetizer repertoire! 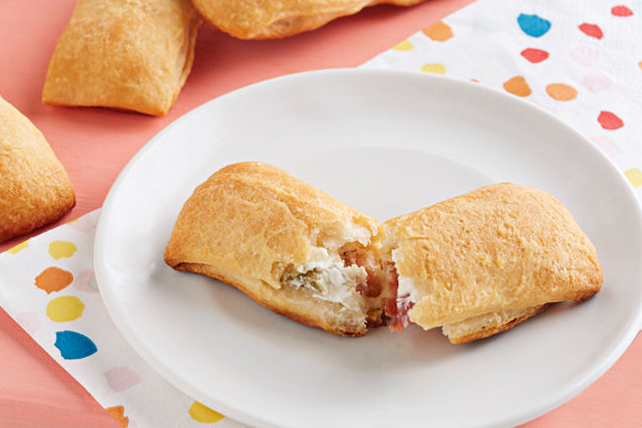 A soft, baked version of the classic jalapeño popper is made by stuffing crescent rolls with PHILADELPHIA Jalapeño Cream Cheese Product and bacon! Unroll crescent rolls on cutting board; firmly press perforations and seams together to form 12x8-inch rectangle. Cut dough crosswise in half, then cut each half into 8 (6x1-inch) strips. Spoon 1-1/2 tsp. cream cheese product onto one short end of each strip; top with 1 bacon piece. Fold strips in half; press edges together to seal. Place on baking sheet. Bake 12 to 15 min. or until golden brown. Prepare using Philadelphia Chive & Onion Cream Cheese Product.